If you’re unfamiliar with Colourpop, they’re an indie brand that has been taking youtube and instagram by storm lately. They have grown so much over the past year, because their products are affordable and very unique. I have posted a few reviews that I will link at the end of this post, but in a nutshell, I love their products. They’re cruelty free and there’s an absolutely stellar range of colors. They started out with only eyeshadows, then added lippies, then added blushes, then added highlighters, and most recently…bronzers. What I love about this brand is their attention to detail and how they constantly keep everyone in suspense as we wait on what they’ll come out with next. I’m so happy that they have had a great deal of success this year, and I wish them nothing but the best as a company. I only ordered 2 things this time, mostly because I really wanted “Birthday Girl.” Don’t judge me, the pretty pink packaging sucked me in. So, I ordered a super shock shadow from the “Rumer Has It” collection, which is a collab with Rumer Willis. I ordered “Swan” because Swan Lake is beautiful in general, and I have a massive soft spot for white shadows…and glitter. White shadows are the only ones that really show up well on my fair skin, and there’s just something so classic about stark white shadow and bright red lips, which is a look I wear often. If you’re unfamiliar with Colourpop’s super shock shadow formula, they’re very creamy and not creamy at the exact same time. Very pigmented, very smooth, and rarely require primer if you wear them alone. For $5 a piece, these are some of my favorite single shadows, and I don’t buy single shadows very often. 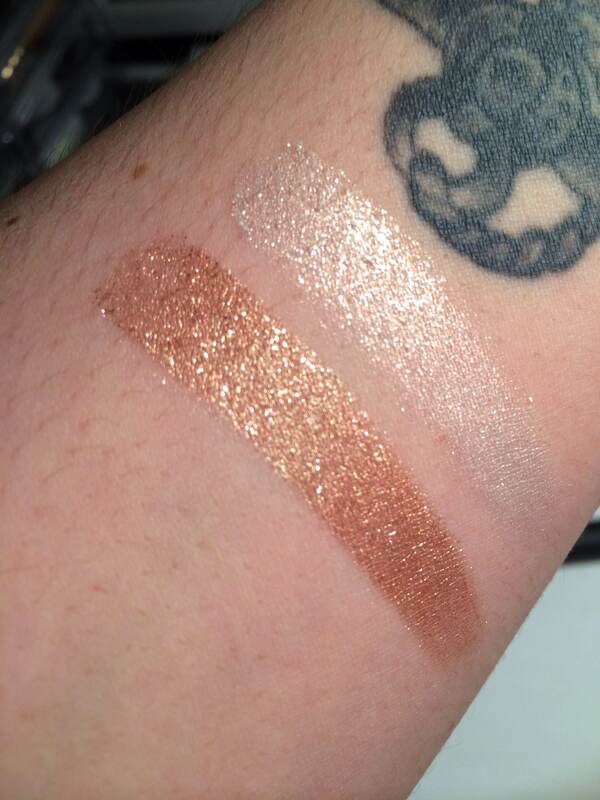 Left is “Birthday Girl” which is a really pretty bronze shade and right is “Swan” which is a glittery and gorgeous white shade. Both of these swatches are done over no primer, and I barely swirled my finger around in each pot to get this pigmentation. These are intense. However, when I was looking closely at Swan I noticed it reminded me of something I already own…”Polyester Bride” by Urban Decay, which is my favorite inner corner highlight to use…and it’s $18 for the single shadow. Well, they’re similar but still different. 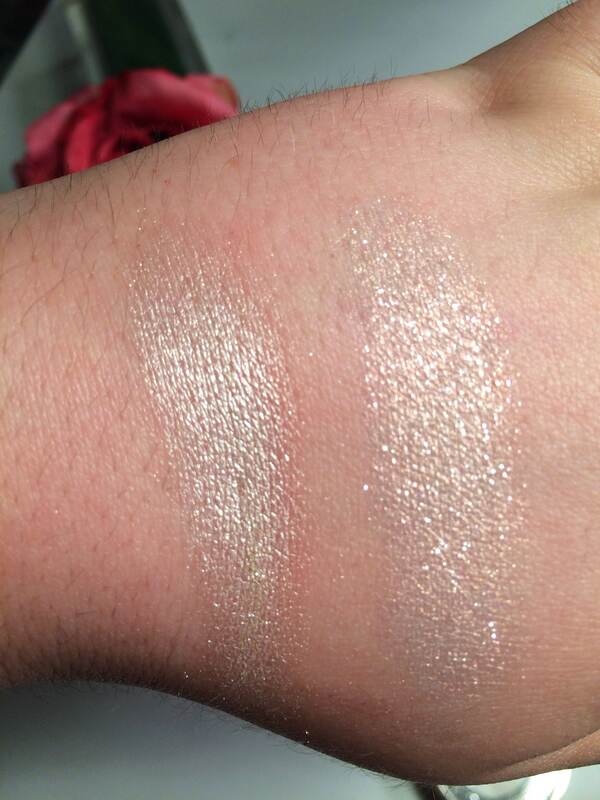 Colourpop’s has more glutter in it and Polyester Bride is more shimmery and a has a bit more silver in it. However, if you’re not too weird about little details, Swan might be a great and affordable alternative if you’re been wanting Polyester Bride, which I do recommend as a shade. Anyway, that’s about it for today’s quick little post. I will be doing a review with swatches soon of the Colourpop Highlighters that I ordered a few weeks ago, so stay tuned! As always, thanks for reading and I hope you decide to stay if you’re new to my blog! Have a great night, lovelies. Those shades are so pretty! I recently ordered the Kathleen Lights shadows and of course right after I place my order they give everyone a free shadow. I’m so bummed! The Birthday Girl is beautiful, love the shimmery bronze shade! Love the review and the photos! Thank you, and I agree it’s a beautiful shade! Yes! It’s more glittery than polyester bride, but pretty close, and it’s one of my favorite shades at the moment. That’s how it goes usually! Last order I made they offered a free highlighter with every purchase a few days after that and I was so bummed haha. 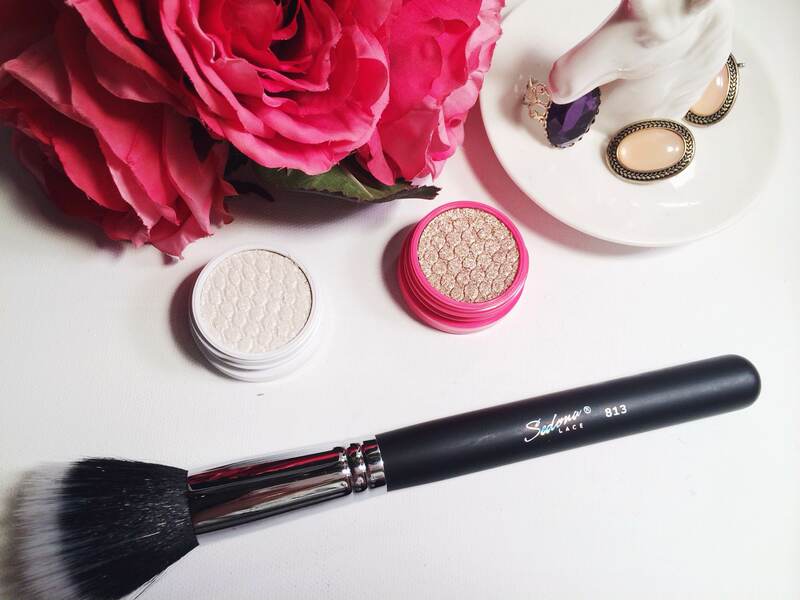 I can’t wait to see your thoughts on the Kathleenlights quad! It looks so pretty!